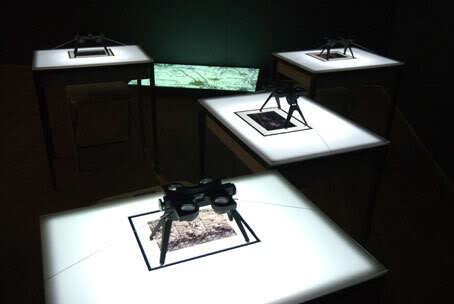 photograph of aerial survey work in progress, 2006 (fake projection). 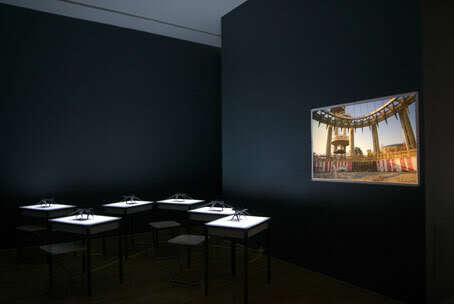 installation view showing Emperor Panorama (light tables, transparencies, stereoscopes) and The State of New York (fake projection). detail view showing part of Emperor Panorama (light tables, transparencies, stereoscopes). 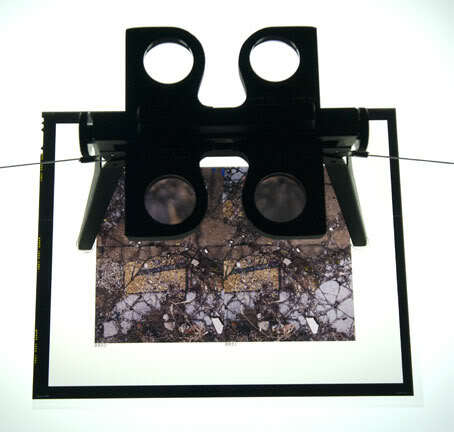 installation view showing Emperor Panorama (light tables, transparencies, stereoscopes) and untitled image sequence (video projection). 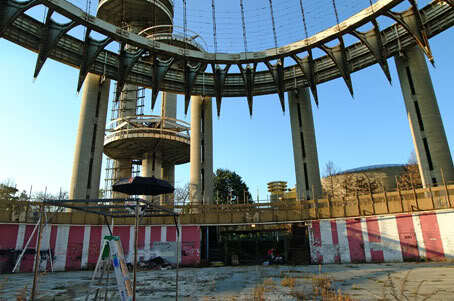 The Queens Museum of Art hosts two exhibitions on the legacy of the 1964/65 World’s Fair: Anthony Auerbach: Empire State Pavilion and the documentary exhibition Back on the Map: Revisiting the New York State Pavilion at the 1964/65 World’s Fair organised by the University of Pennsylvania Architectural Conservation Department. Auerbach’s installation reflects on one of the most memorable features of the World’s Fair. Like the New York City Pavilion, which housed the Panorama of the City of New York, the New York State Pavilion contained a miniature representation of the whole state in the form of a giant road map inlaid in the terrazzo floor. While the Panorama has been preserved and updated over the years, the terrazzo map became derelict and overgrown. Before to the recent conservation project on the map began, Auerbach made a complete documentation of the entire surface of the map. Adopting aerial photographic techniques as used by geologists, archaeologists, cartographers and spies, Auerbach recorded the state of New York from a height of seven feet. His aerial survey resulted in some 2,500 detailed images of a map turning back into a landscape. Half-way between a surveyor’s office and a peep show, Auerbach’s installation invites the viewer to look — to inspect and decipher the material preserved in the artist’s photographic archive. In part: NYC Department of Cultural Affairs and New York State Council on the Arts. The Queens Museum of Art was established in 1972 to provide a vital cultural center in Flushing Meadows Corona Park for the borough’s unique, international population. Today it is home to the Panorama of the City of New York, a 9,335 square foot scale model of the five boroughs, and features temporary exhibitions of modern and contemporary art that reflect the cultural diversity of Queens, as well as a collection of Tiffany glass from the Neustadt Museum of Tiffany Art. The Museum provides valuable educational outreach through a number of programs geared toward schoolchildren, teens, families, seniors and individuals with physical and mental disabilities. Suggested donation: $5 for adults, $2.50 for seniors, students and children, and free for member and children under 5.